Posted bymarkal	 2011/01/16 2011/01/16 Leave a comment on I want more digital outputs! Arduino offers quite a few digital outputs, but sometimes you want even more… When a keypad and LCD are connected, it doesn’t remain much free outputs. 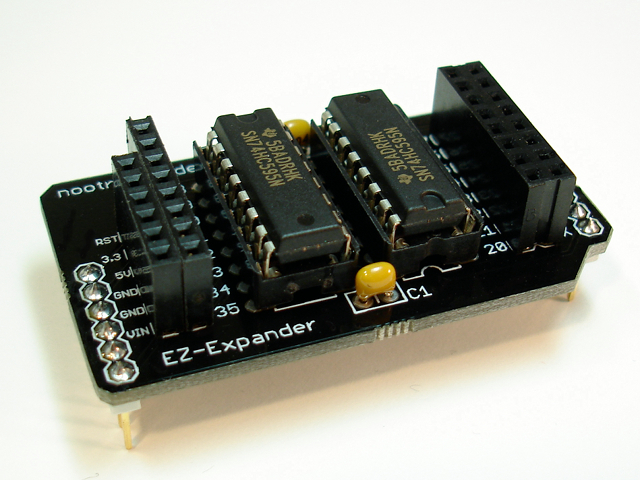 Today I found out a simple solution for that – EZ Expander shield. The shield utilises two shift registers, 74HC595 to ‘multiply’ digital outputs. Of course, the additional outputs can be used only in output mode (there is no possibility to read from them). There is a few other interesting things at nootropic, for example Arduino-based video game system. It uses TVout – library for generating composite video on AVR chip (so, Arduino too). If you want to know, how to generate video with Arduino, check the Sprae’s blog (Arduino as a graphics card – unfortunately, only in Polish).